Andrew Lloyd Webber's new Stephen Ward musical based on the Profumo Affair will open at the Aldwych Theatre on 19th December 2013 (previews from 3rd December). It will be directed Directed by Richard Eyre and is the first collaboration between Andrew Lloyd Webber, lyricist Don Black and playwright Christopher Hampton (who has written the book) since their 1993 musical Sunset Boulevard. Lloyd Webber and Black have also worked together on Tell Me on a Sunday (1980) and Aspects of Love (1989). Stephen Ward's part in the 1963 scandal is that he was the fashionable osteopath and party arranger for the aristocracy who introduced politician John Profumo to Christine Keeler (a call girl and the reputed mistress of an alleged Soviet spy) at the Cliveden country house party. Ward committed suicide on the last day of the court trial which damaged the reputation of Prime Minister Harold Macmillan's government. Profumo resigned followed by Macmillan a few months later because of ill health. The production will be designed by Rob Howell with choreography by Stephen Mear, lighting by Peter Mumford and sound by Paul Groothuis. The musical is produced by Robert Fox Limited and the Really Useful Group. Casting is still to be announced, but as already blogged Alexander Hanson who took part in the workshops is currently in negotations to play the lead role. 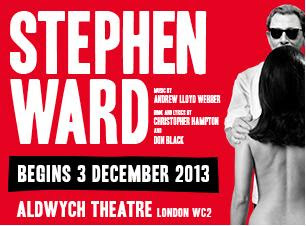 Tickets for Stephen Ward the Musical which is currently booking until March 1st 2014.